On Wednesday, May 4, the Office of Service Learning (OSL) at Fairfield University celebrated a year of great student projects and 2015 service learning courses, and introduced four new courses for next year. The Kelley Center Presentation Room was filled with students, faculty and friends surveying the poster presentations of over 20 student projects. The projects ranged from field experiences in Brazil, to the impact of border politics to end-of-life communication. Projects were also developed across a variety of fields, from economics to nursing. Under the guidance of Dr. Linda Roney, a service learning project by Casey Heely '16 and Kathleen Sirna '16 focused on Pediatric Service Learning where students observed, interacted and taught pre-school aged children outside of a hospital setting in order to learn the importance of cultural competence in the healthcare system. Junior pediatric nursing students visited early childhood learning centers, like ABCD in Bridgeport, to teach children about various issues ranging from bullying to how to be a good friend. Students were able to teach a diverse population of 2-3 year-old students and tailor their teaching to a wide range of learning needs by creating props for teaching including: coloring pages, songs, games and books. 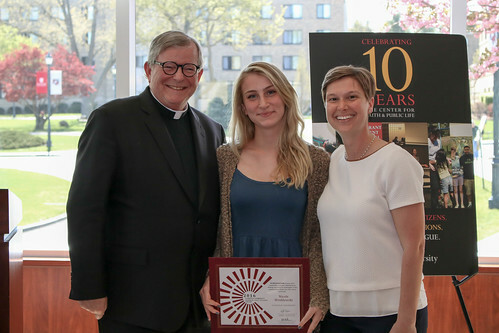 After the poster session, the formal event began with the recognition of Nicole Wroblewski ’18, an international studies major, who was presented with the 2016 Newman Civic Fellow Award for her work with Simply Smiles, a not-for-profit organization bringing brighter futures to the community in the Cheyenne River Sioux Tribe Reservation. The fellowship, one of 201 across the country, is part of Campus Compact, a national coalition of nearly 1,100 college and university presidents committed to improving community life and educating students for civic and social responsibility. Additionally, the Ernest P. Lynton Award for Early Career Community Engaged Scholar was presented to Dr. Bryan Crandall. The Outstanding Community Partner Award was presented to Connecticut’s Beardsley Zoo and to William King from Bassick High School. Each year, the Office of Service Learning provides funds for course development. Service learning courses with OSL grant support for 2016-17 will include: Municipal and Non-for-profit Accounting, Texts and Contexts, Poetry Writing, World of Publishing, Imagining Shakespeare and Topics in Language & Culture.